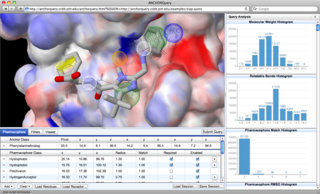 AnchorQuery™ is a specialized pharmacophore search technology that brings interactive virtual screening of novel protein-protein inhibitors to the desktop. 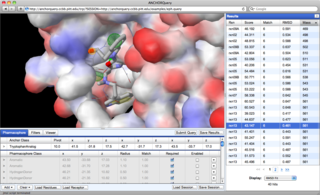 Try one of the interactive examples or read the Getting Started guide in the User Manual to search for a custom pharmacophore. 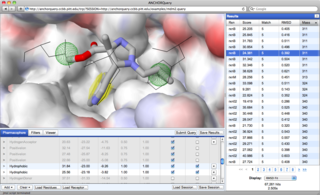 Extract PPI inhibitor starting point pharmacophores from PPI structure with PocketQuery. Interleukin-2 plays a key role in the immune system’s response to infection. In this example, the pharmacophore is derived directly from a small molecule that partially mimics the anchor side-chains contained in the quaternary receptor signaling complex (PDB 2B5I). Inhibitor of apoptosis (IAP) proteins inhibit the catalytic activity of caspases. In this complex, theXIAP-BIR3 domain traps caspase-9 in a monomeric state, preventing catalytic activity. A small-molecule inhibitor could potential restore catalytic activity, re-activating the apoptotic pathway. This interaction is an anti-cancer target. MDM2 negatively regulatesp53, the “guardian of the genome,” and is overexpressed in many human tumors. Inhibitors of p53/MDM2, some of which have progressed to clinical trials, target the MDM2 pocket defined by three anchor side chains of p53. GP41 is a glycoprotein that is instrumental in the fusion of HIV to a host cell. Peptide-based fusion inhibitor drugs, such as enfuvirtide, prevent the complexation of gp41 with gp120. 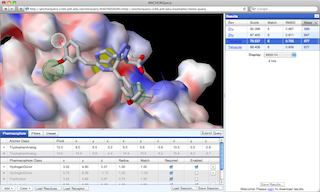 Small-molecule inhibitors target the same pocket in the gp41 trimer. IKK is an enzyme complex involved in propagating the cellular inflammation response. NEMO associates with unphosphorylated IKK kinase and activates the catalytic activity. Small molecule inhibitors of NEMO/IKK have therapeutic potential for reducing arthritis, asthma, autoimmune disease, and certain cancers. Ephrins and Eph receptors are components of cell signalling pathways. These interactions play a role in many aspects of cell development, and are also overexpressed in some cancer cells. 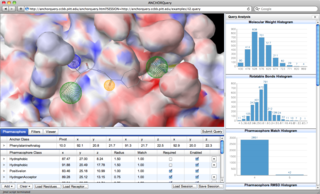 AnchorQuery™ leverages the concept of anchors, amino acid residues that bury a large amount of solvent accessible surface area at the protein-protein interface. 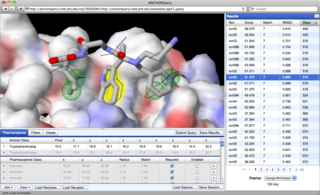 Every compound in our multi-component reaction (MCR) accessible virtual library contains an anchor analog, a functional group that is a chemical mimic of a specific amino acid. AnchorQuery™ pharmacophore queries always include an anchor feature in addition to the standard hydrophobic, ionic, and hydrogen bond donors. All non-anchor features are stored relative to a coordinate system defined by the anchor in an efficient spatial index. Pharmacophore searches scale relative to the breadth and complexity of the query, not the size of the database. As a result, full 3D pharmacophore searches can be executed over millions of explicit conformations in a matter of seconds.